Storage: Please keep in dry cool place, avoid heavy pressure. Enjoy this product soon once the interior package is opened. 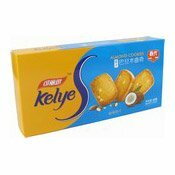 Ingredients: Wheat Flour, Margarine, Sugar, Coconut Juice, Almond, Butter, Milk Powder, Egg, Desiccated Coconut, Starch Powder, Vegetable Oil, Ammonium Hydrogen Carbonate, Sodium Hydrogen Carbonate.